Come enjoy some "downward dog" time at our Yoga and Adoption event benefiting Braveheart Animal Rescue at the Downtown Arlington Farmer's Market! 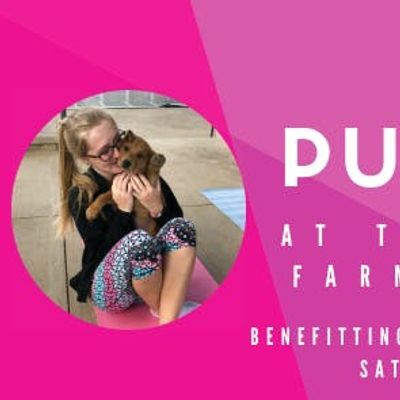 Join Arlington Yoga Center, Union Worx Co-Working, and Braveheart Animal Rescue for an exciting afternoon full of giggles and licks...oh, and a little yoga! Braveheart Animal Rescue will have a table set up, offering adoption services, answering any questions you have about their organization, as well as providing the adoptable dogs during our yoga class! This class will be held OUTDOORS (weather-permitting) and is family-friendly! -The dogs will be provided for Pup Yoga, please leave yours at home! -While some yogis may take themselves (or their yoga practice) very seriously, pup yoga is for everyone and we welcome any and all participants. Remember we will be practicing with live animals, anything is possible! We will definitely have time after the yoga class to snuggle, take pictures, and socialize with the dogs in case you want more! After class feel free to head across the street to the Farmer's Market, grab your drink, and peruse all the homemade goods and produce from the market vendors! *NOTICE OF FILMING By participating in this event, you agree that you may be photographed and filmed, and you grant Arlington Yoga Center the right to use, publish and copyright your picture, likeness and/or name in videos and/or photos taken during this event for use by AYC, in perpetuity and throughout all media. By participating in Puppy Yoga, you agree to be solely responsible for any and all liability costs, damages and expenses incurred as a result of any injury or occurrence sustained from participating Puppy Yoga with Arlington Yoga Center. You further agree to be held solely responsible for any and all liability costs, damages and expenses incurred by your child or attending minor as a result of his/her participation, either directly or indirectly, in Puppy Yoga with Arlington Yoga Center. You agree not to hold Arlington Yoga Center, its employees, volunteers, instructors and/or representatives responsible in any way for any injury or occurrence whatsoever. In instances of class cancellation, AYC will honor all tickets and attendees at another class of their choosing.